1. 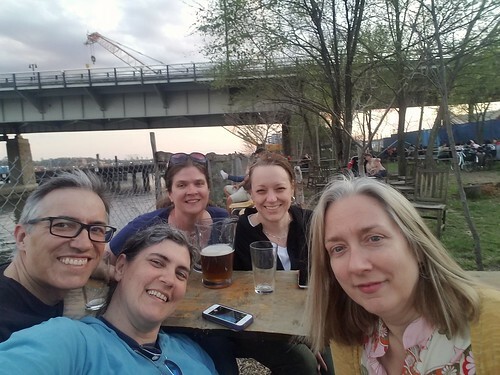 Sarah had a birthday this week and invited folks to join her down at the new’ish beer garden next to the river for drinks. It had a shaggy, shabby backyard vibe going on — so, very relaxed and very comfortable — which was perfect for a group of middle-aged friends. 2. Rudi started a new position within his company this week. It’s doing outreach and promotion, which he’s going to be awesome at. I’m pleased for him that this is more in line with what he’d been looking to do and pleased for his company that they have found such a strong advocate for their products. 3. In the pre-dawn hours you can hear all the birds that live in the tree outside our building calling to each other. There’s at least one nest of babies, who are VERY HUNGRY!!! so glad your husbands new role at work is looking good! We still have freezing cold winds and weather so, no open windows to hear anything.